Last year, when I was really into making lists, writing and avoiding my job, I made an “Overrated Albums of 2012” list. (You can read it here.) I also spent a lot of time, during said End Of Year recap, talking about how revisiting albums over and over again can help you see (read: hear) something you didn’t before. 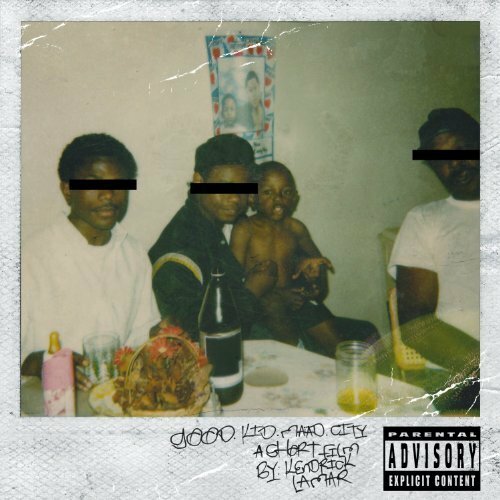 I was so hell bent on hating everything about Kendrick Lamar even after having “tried” listened to good kid, m.A.A.d city and reading long pieces dissecting the narrative (I recommend these two) that I decided I would turn away from it forever. So instead, I wrote something really stupid that current Sarah hates but so be it. So now I’m proud to announce that I absolutely love good kid, m.A.A.d city and can reenact it for you in person if you like. I don’t remember when it started, I just know that it did. About a month ago one night, I turned on good kid, m.A.A.d city and waded knee deep into the good kid, m.A.A.d city Wikipedia page (which is also a helpful narrative guide. I’ve typed “good kid” into a new Google Chrome tab so often that its web address just appears). Before I knew it, I was listening to good kid, m.A.A.d city and not hating it. All semester I’ve been thinking how I could possibly write about hip hop and my racial identity. And then one night, because, you know, I was listening to good kid, m.A.A.d city and this came out. No matter how many books I read or how many records I listen to, a piece of me is always missing. The words appropriation and injustice are too big. I can’t pronounce them. Call me a WOP or a mick, it doesn’t fill the hole or stitch the gap. It will never go away. Hip hop, a genre of my race oppressing another, will never belong to me. Fight the power? I’m the power. My color will never go away. Which came first? Jazz is older, soul, rhythm and blues. Do we all own it if enough time passes, if enough people call it their own? When a mind bends and changes, does my profile change? Headphones create space. Inside, I can be who I want to be. But even still, there are more words I can’t pronounce, not even if I try. Women are everywhere but not the women I know. Their bodies are misshapen. My history precedes me. My politics don’t protect me. Vocals repeat in my head, I recite along with the record. In my head when I fall asleep, when I walk down the street, do they know what I’m listening to? What would they say? What do I say when I’m caught? Hip hop, a genre of poetry and violence, is misunderstood. Explain it. Would they listen to me even if I know the facts? The stories get longer, there’s more to memorize. It changes over time. It changes time. It doesn’t change me. My race stays the same. A few like me are up in the lights. Does my profile ever change? What’s theirs used to be mine, when it shouldn’t have been. Now what’s theirs is mine and no one seems to mind. It’s every format, portal and platform. Type and shade change. The beats, samples, the form, the timbre, the loop, the sketches – it is a part of them. Can it be a part of me? It’s 417 words because that was my final workshop assignment: “417 words on anything.” I’m publishing it here because I can and because when you start writing about what you’ve always written about in an entirely new way that (quite frankly) freaks you out, you embrace it and tell everyone you know about it at the same time. So I “handed this in” and got so much feedback on it that I couldn’t stop. good kid, m.A.A.d city became another lobe in my brain. In the last month I’ve listened to Kendrick Lamar 147 times (according to last.fm). There are 12 tracks to the record, you do the math. So when I was assigned to write about a random gerund in craft class, I ended up writing about GKMC because hip hop. My gerund was spelunking. And before I knew it a 200 word free write became a 1400 word metaphor for good kid, m.A.A.d city. I fall deep into oblivion – into something that’s too big to hold me. The history is too big, my color is all wrong and even while I hold the sides I can’t see my hands. Somewhere, there’s a rope. I know it’s there because it’s around my waste. I start to climb. The rocks are wet but the grooves in my hands hold. I scale. good kid, m.A.A.d city felt like rock climbing at first. Hip hop itself is a hole. It fills me up but never all the way. I’m always searching for my hands, searching for something. There’s a track one but it’s not the right place to start. It’s busy and everything about it is something I hate: drum machines. They’re not actually everywhere, but it’s still all I hear. Drum machines are the sound of laziness. Dr. Dre is an excellent producer, and only the executive at that. I know he’s better than this, but he also built his sound on digital sound recording. At the end of “m.A.A.d city” that signature sound comes in. I find it comforting. It’s the sound of a computer in 1992, “wee-oo-weeeahh-wee-waaah-wee-wee,” the sound of a filter on a synthesizer undulating. There’s not an easy way to explain it. Just listen to The Chronic. My world looks nothing like this. How can I relate? Hip hop has never felt so complicated. I try to frame it with my line of vision, pieces of something come together and it starts to make sense. Like climbing, you have to do it over and over again, but never in the same pattern. I shift my body, one limb at a time, to fit in cracks and crescendos. History doesn’t repeat itself, it rhymes. Lines over and over are a pattern. The pattern tells a story. We meet Sherane, Kendrick’s temptation, on track one. Neighborhoods I’ve never been to before flash in my imagination, I see house parties. I was at one like this once, but just once. I was the only white person, everyone else knew each other, they taught me to play hearts, the cognac was delicious, brandy is kind of like whiskey, but only kind of. Everything became familiar after hours. The higher from the ground I am, the drier the rocks are. Ironic, isn’t it? As I navigate the narrative, I find my footing. It’s not linear. The story is slimy. The pattern is production, like gorges, natural but never the same twice. It’s not until the end of the record, does it make sense as a whole. Like seeing the top, the whole frame. Kendrick scars his throat as he changes the timbre, like a jagged, crumbling rock. His pace quickens mine. Mentally, I stop to listen but I just move up. It’s not distracting. It’s intoxicating. Look down at the distance I’ve made. Every once and a while I slip. The line, “wifey, girlfriend and mistress” is stupid. Even worse is one of Drake’s verses, “Don’t run from/where we come from.” He’s a half Jewish and Canadian. I have issues with him. He didn’t ‘start from the bottom’. He’s a teen TV star. But the hook on the track has me singing over and over again about “Poetic Justice”. Higher and higher I go. The narrative gets clearer, his alter ego between “good kid” and “m.A.A.d city” explain why he’s not studying, when his blunt is laced, why his neighborhood is the way it is. I’m frustrated by the uninteresting turns the narrative takes when Kendrick physically navigates me through the city in a van with his friends, “we took a right, then a left, then a left then another right.” It’s boring and uninteresting, the same neighborhood I don’t know. I don’t fall but I don’t move forward either. The record opens with Kendrick and his friends reciting the Jesus Prayer, a prayer usually said as a meditation over and over again. A call to god, it’s a mercy prayer, an appeal to human nature for God to understand human shortcomings. It’s even before we meet Sherane but after the m.A.Ad city suspends Kendrick’s life in Compton. Fifty-four minutes later, we hear where it came from, after a friend is shot dead, after they break in and rob and shoot as they drive by. When water comes full circle as the lace in the narrative, the rocks are dry. But I have no literal footing with Jesus. “Sing About Me/I’m Dying Of Thirst” has several movements across its twelve minutes. It shifts my center of gravity. “I hope you come back and learn from your mistakes,” his mom says. “Come back a man. Tell your story to these black and brown kids in Compton. Let them know you were just like them, but you still rose from that dark place of violence, becoming a positive person. When you do make it, give back, with your words of encouragement.” At the end of “Real” a tape rewinds. “Compton” is the album closer. The chorus, “Compton/Compton/ain’t no city quite like mine,” repeats. Compton is one of the oldest cities in the country. Founded in May of 1888, it’s a hub because of its location in Los Angeles County. Just under 100,000 people live there. Compton is known for its gangs and violence. Gangster rap came from Compton and changed the course of hip hop, spiking the genre’s foundation. Subgenres are everything. Dr. Dre is featured on the track. It sounds like east coast production, like Jay Z’s horns and orchestration. They do this while they’re honoring their city, the left side of hip hop, “look who’s responsible/for takin’ Compton into national,” Dre shouts. Is their fusion of production a peak? The Daft Punk voices come in as the beat drops. My feet lock into place. I pull up and see the frame of the Pacific Ocean. Spelunking, they call it. Cave dwelling, searching the unknown. It’s a hobby and a practice. I’ve never been rock climbing before. But it feels like I have. Consider this my good kid, m.A.A.d city narrative guide. And also consider it a new way to write about music on a site that I started so I could write about music however I wanted. Because you can write about music however you want to too. Now, excuse me. I need to go listen to Kendrick Lamar.